The history of the 15 puzzle. For a long time it was not clear when the first slide puzzle was invented or made. 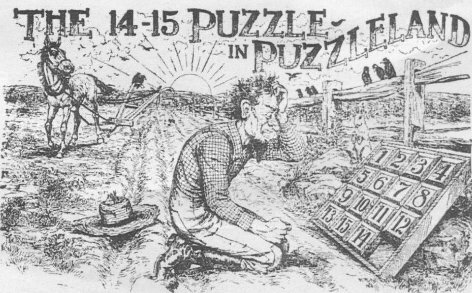 But it is was thought to be a well known fact that in 1878 Sam Loyd, America's greatest puzzle-expert, "drove the whole world crazy" (in his own words) with his newly "discovered" 14-15 puzzle. This was a variation on the "Puzzle of 15" which was made and sold by the Embossing Company from New York about 10 years earlier. This puzzle consisted of 15 numbered square pieces that could be slided around in a square box that was big enough to contain 16 pieces. The pieces should be placed at random in the box and you should sort the pieces in ascending order without taking the pieces out of the box (so the only thing that is allowed is to slide the pieces). Not every randomly placed pattern of pieces can be sorted by just shuffling and Sam Loyd cleverly made use of this fact. It was not surprising that Sam drove the whole world crazy by his variation of the puzzle of 15. The problem that he formulated was impossible to solve. When you bought Sam's 14-15 puzzle the empty square was positioned bottom right. The pieces were numbered in order from left to right and from top to bottom; only the pieces numbered 14 and 15 were reversed. You should re-order the pieces so all the pieces are in the correct position and the empty place should be positioned bottom right again. For the correct solution a prize of 1000 dollar was offered but Sam kept that money in his pocket. A slide puzzle with square pieces can only be solved when the number of exchanges necessary to solve the puzzle is even. The 14-15 puzzle attracted a world wide attention that can only be compared with the Rubik's Cube that conquered the world 100 years later. Ernö Rubik was in fact inspired by the slide puzzle when he designed his famous cube which can be seen as a 3 dimensional version of a slide puzzle. Quotation from the Cyclopedia of Puzzles written by Sam Loyd. "The older inhabitants of Puzzleland will remember how in the early seventies I drove the entire world crazy over a little box of movable pieces which became known as the "14-15 Puzzle". The fifteen pieces were arranged in the square box in regular order, only with the 14 and 15 reversed, as shown in the figure. The puzzle consisted in moving the pieces about, one at a time, so as to bring them back in the present position in every respect except that the error in the 14 and 15 must be corrected. A price of $1000, which was offered for the first correct solution to the problem has never been claimed." "Sam Loyd did not invent the 15 puzzle and had nothing to do with promoting or popularizing it. The puzzle craze that was created by the 15 Puzzle began in January 1880 in the US and in April in Europe. The craze ended by July 1880 and Sam Loyds first article about the puzzle was not published until sixteen years later, January 1896. Loyd first claimed in 1891 that he invented the puzzle, and he continued until his death a 20 year campaign to falsely take credit for the puzzle. The actual inventor was Noyes Chapman, the Postmaster of Canastota, New York, and he applied for a patent in March 1880." A clever variation of the 14-15 puzzle is the so called "Rate your mind pal" puzzle that is shown beside. This puzzle seems impossible to solve at first sight, certainly for someone who is familiar with the 14-15 puzzle. This puzzle can be solved however. Think hard ... and when you do not find the answer ask me for a hint. Since the famous Sam Loyd's slide puzzle thousands of different slide puzzles are made. Most of them formed a picture when correctly solved. A slide puzzle with the companies logo was used by a lot of companies as a small gift for their relations. Click here to see some examples. Around 1910 the idea to use rectangular pieces came up. These puzzles are most of the time much more difficult to solve than puzzles with only square pieces. For more information on slide puzzles you can consult Edward Hordern's book Sliding Piece Puzzles published by the Oxford University Press in 1986. A detailed discussion of the puzzle of 15 and others is given in Automated Reasoning: Introduction and Applications, by Larry Wos, Ross Overbeek, Ewing Lusk, and Jim Boyle published by McGraw-Hill. A nice variation of the basic slide puzzle is a slide puzzle with 15 pieces numbered form 0(empty) to 15 (inclusive) with the instruction to slide the pieces so the sum of all rows and the sum of all columns and the sum of the diagonals equals 30. Such an ordering is called a magic square.